9, carrefour de l’Odéon, in the 6th Arrondissement. Last night marked my fourth visit to L’Avant Comptoir in just over a week. This new wine bar is nowhere near my apartment, so why am I returning again and again? It’s the ham. To be precise, it’s the deep-fried ham croquettes. 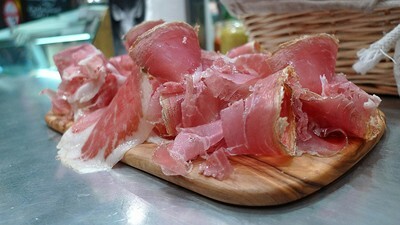 Made with jambon Ibaïona d’Eric Ospital (Iberian ham from a legendary producer), these little nuggets are like eating, as the Frenchman next to me observed, “une caresse.” Priced at only 3 euros for a stack of three, they represent the cheapest love on sale in the French capital. Those who prefer their ham without breading will be delighted by the legs swinging from the ceiling. The salty jambon corse mingles with its Basque and Bigorre cousins above a stash of spicy chorizo and Andouille béarnaise. Order up a planche and then help yourself to the freshly baked bread, Bordier butter and cornichons that are lined up on the counter. Speaking of the counter, I should mention that this place is only a bar with standing room for about 12 people. 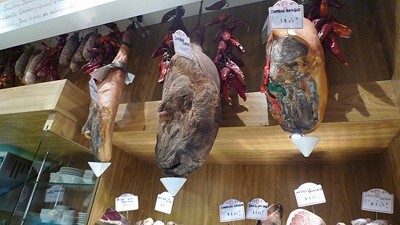 You’ll start as strangers, but hours of pressing close and tasting one another’s ham will likely turn you into friends. Last night, for example, our countermates invited us to their apartment next door to finish the evening with a 1963 Armagnac. Yes, it’s that kind of place. Beyond the pork (and the duck neck, and the grilled scallop, sigh…) offerings, vegetarians have plenty to love at L’Avant Comptoir. There’s a lovely Breton artichoke served whole for dipping into silky olive oil, and the grilled cèpe (porcini mushroom) is a minor miracle. The wine list is short, with plenty of inexpensive treats. I like to begin with the bubbly Mauzac Nature and continue on to the Côtes de Gascogne (2 euros a glass!). And I always make my way over to the magnum of Morgon at some point—it’s just perfect with the ham. Adding to the appeal, L’Avant Comptoir is open every day, with service continu and a takeout window selling sandwiches and crêpes. I may have to relocate to the 6th. . . .
To read more about this new crush and the man behind it (Yves Camdeborde), check out these posts from the Paris Kitchen, Dorie Greenspan and Serve It Forth. In a nutshell: Hit L’Avant Comptoir for a snacky apèro, or camp out at the counter and make a night of it (even on Sunday!) by sharing rounds of tapas with friends and strangers. 41, rue de l’Arbre-Sec, in the 1st, near Métro Louvre-Rivoli. 01 49 26 90 60.